This Summer I am going to India on an internship with UNESCO – (United Nations Educational, Scientific Organisation) and the Snow Leopard Conservancy Trust. I will be based in Leh in the Himalayas and will trek with the Snow Leopard Trust to nearby villages in Ladakh. The purpose of my trip is to collaborate with Ladakhi villagers to develop design ideas for hand knitted products with a contemporary appeal. 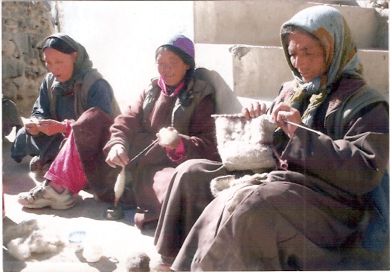 Working with traditional designs, patterns and natural yarns, our role will be to help improve the quality of the knitted handicrafts which will benefit villagers living along the tourist trekking routes. Wow thats amasing!! cant wait for the next update!! Good luck and love the website!!! !